To analyse the diagnostic accuracy of age-related optic nerve sheath diameter (ONSD) cut-off values in children for detecting raised intracranial pressure (ICP) and to assess the benefit of using patency of the anterior fontanelle in describing a different set of cut-off values. 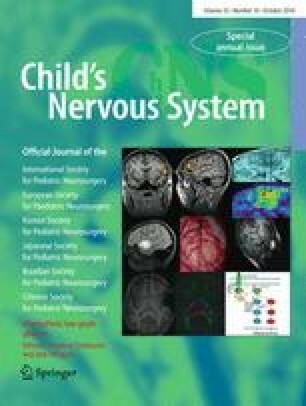 The ONSD measurement was performed prior to invasive ICP measurement in children under general anesthesia. The diagnostic accuracy of the ONSD measurement was compared to ICP at thresholds of 20, 15, 10, and 5 mmHg. This was further analysed in children above and below the age of 1 year, with a subgroup analysis of age at 4 years, and assessment of the anterior fontanelle (AF) as a reliable physiological marker in part II of this study. Data from 174 children were analysed. In children ≤1 year old, the ONSD measurement with the best diagnostic accuracy for detecting ICP ≥ 20 mmHg was 5.16 mm, compared to 5.75 mm in children >1 year old (p < 0.001). In addition, patency of the anterior fontanelle (AF) was found to be a useful clinical marker for defining different ONSD cut-off values at ICP thresholds of 20, 15, 10 and 5 mmHg. Transorbital ultrasound measurement of the ONSD is a reliable non-invasive marker of ICP particularly at higher thresholds of 20 and 15 mmHg. Patency of the AF is a useful clinical marker for defining different ONSD cut-off values in children.